Interest Houses provide an opportunity for groups of students to live together for the purpose of exploring a common theme or connection. The group defines goals and objectives, and members of the group agree to work toward achieving the stated goals. Some Interest Houses are operated with collaboration from a College office. These houses work closely to fulfill not only the mission of the house but also the values of the office they work with. *Please note, if you are requesting a housing accommodation, it may not be possible within a specific interest house. Meeting the accommodation need is the primary priority. Student preferences are considered but cannot be met in all cases. Asia House provides support to Asian and Asian American students and their allies at Carleton College. Educational and social programs aimed towards the understanding of Asian and Asian American cultures and issues are held throughout the year. All Carleton students are invited to apply to live in the house and to participate in Asia House programs. More information on Asia (Hall). The Carleton Association of Nature and Outdoor Enthusiasts (CANOE) is a group of students who love the outdoors and want to share that experience with other students. CANOE is one of the largest student organizations on campus, with hundreds of students going on our trips ever year. They offer student led trips for hiking, camping, snow shoeing, skiing, dog sledding, canoeing, climbing, and pretty much any other outdoor activity that you can think of. The members of Culinary House strive to have a pleasant community living environment focused around the preparation and enjoyment of good food. Members explore various culinary genres and traditions. Culinary Interest House is a resource for culinary learning and experience. Gender House is open to all students while trans* or gender non-conforming individuals wishing to live in this house community and strongly encouraged to apply. The mission of Gender House is to create intentional community for students to focus on exploring gender identity and inclusivity as a platform to promote gender based activism on campus in the in the greater community. Gender House is advised by the Gender & Sexuality Center. Farm and Parr Houses foster awareness and appreciation of sustainable agriculture and sustainable living. Members plant and tend an organic garden, offer educational programs focusing on sustainable living, and host communal dinners. F.I.S.H. House is a place in which residents grow spiritually in their walk with God with the encouragement of the other members of the community. It is a community fortified with love, compassion and tolerance that a Christ-like attitude engenders--tolerance for both differences within the Christian faith and for beliefs outside of the Christian faith. It is a place where residents challenge each other with new ideas and new interpretations of old truths. It is a place to share the Christian faith by living the Christian faith. Freedom House provides a culturally safe space for students of African Diaspora and their allies at Carleton College, and contributes to the environment that facilitates their success. Freedom House residents provide a variety of educational, cultural, and social program. All Carleton students are invited to apply to live in Freedom House and to participate in all programs and meetings. More information on Cultural Houses at Carleton. Stimson House serves as the programming center for the Office of Intercultural & International Life. Programs hosted at Stimson are open to all students, faculty, and staff. On a day-to-day basis, Stimson House is a safe space for students to come together to relax, socialize, meet, and study. Our hope is that Stimson House will also be a place where students can have informal but meaningful interactions with students from diverse backgrounds. Housing options in Stimson House are reserved for student peer leaders who work for the Office of Intercultural & International Life. Jewish House serves as the geographic center for Jewish life and culture on the Carleton campus. It provides a comfortable space for kosher meals, Jewish social and cultural activities, and community religious observance of the High Holy Days and Passover. Page East offers a welcoming place to gather on Friday nights for services and Shabbat dinner prepared by students, and also for weekly Torah study. Students can join in talks about American Jewish experiences and Israel, some of which are conducted in Hebrew as part of our modern Hebrew program’s extracurricular activities. The main role of Jewish House is as a center for Jewish life that is open and accessible to all members of the Carleton community, Jewish or otherwise. La Casa del Sol is a house designed to serve both the Latin@ community at Carleton College, as well as their allies and the larger Carleton and local Northfield community, through educational and cultural programming. La Casa is an integral part of the Latin@ community at Carleton because it encourages academic success and community development. 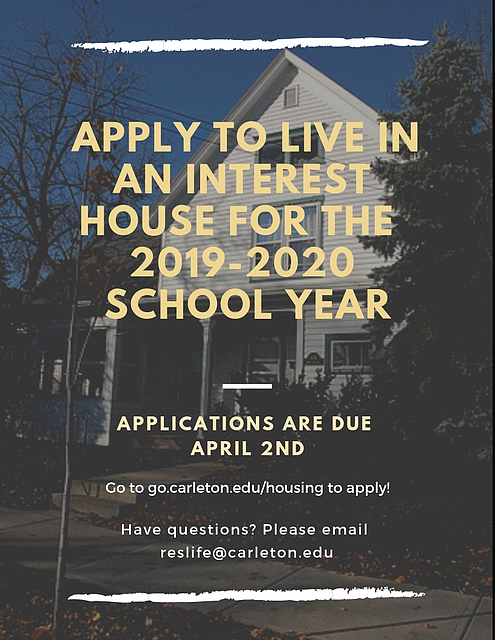 All Carleton students are invited to apply to live in the house and to participate in programming at Casa. More information on La Casa del Sol. Muslim Interest House serves as a hub and home for Muslim life at Carleton. It provides a space for Muslim social and cultural activities, halal meals, and community. The Muslim Interest House also provides a space for communal religious observance, such as fasting during Ramadan and Friday prayer. The Muslim Interest House seeks to be a center that can promote dialogue on issues related to Islam and Muslims, as well as build understanding among different religious and cultural communities. It is a space for learning about one another, sharing our narratives, and seeking to build relationships across communities and the diverse identities that we each hold. The Muslim Interest House is open and accessible to all members of the Carleton community. Ailya Vajid, Associate Chaplain for Muslim and Interfaith Life, is the advisor for Muslim Interest House. Prospective residents are welcome to submit their applications and any questions to Ailya at avajid@carleton.edu. Muslim Interest House is a female-identified residential space, but non female-identified individuals are welcome to attend events and be in the house for socializing. The mission of QTPOC serves to provide & protect a community space that centers the intersectionalities of race, gender and sexuality. These intersections are not limited by but include: lesbian, gay, bisexual, transgender, queer, questioning, asexual, intersex, non-binary, and allied students of color at Carleton College. The house serves as a safe, inclusive living space for LGBTQIA+ students of color, and offers outreach in the form of social programming to build cohesion in the larger community of the college. These activities and dialogues are intended to promote understanding of the intersections between race, socioeconomic disparity, and LGBTQIA+ issues to affirm the needs and experiences of QTPOC students at Carleton. QTPOC House is advised by the Gender and Sexuality Center. The members of Science Fiction House imaginatively explore the possibilities of humanity. The house offers a variety of activities such as book discussions, craft projects and movie nights. Wellstone House of Organizing and Activism (WHOA) works to foster activism on campus and communities outside Carleton by sponsoring events, delegations, dinners, etc. WHOA is devoted to creating a space for people to come together as human beings who desire social change. Members of WHOA are committed to raising awareness on a variety of issues and serving as a hub for any and all Carleton activists.